Machine Translation Engines put to the test! With every search engine offering its own machine translation technology, have you ever wondered which works best? Gabble On is putting together a public research project to compare the machine translation results of Google, Microsoft and Babelfish in order to answer a simple question: “Which Engine Translates Best?”. Votes can be entered until March 29, 2010. Shortly after, Gabble-On will share its results with the public. 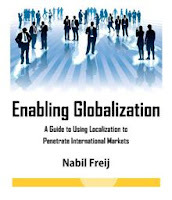 In gratitude for voters’ participation, a lucky participant will receive an Apple iPad with the eBook Enabling Globalization, A Guide to Using Localization to Penetrate International Markets. Other 10 voters will also each receive their free copy of the eBook, courtesy of GlobalVision International, Inc. Both Google and Microsoft rely on the same statistical machine translation technology that is based on the Moses project. They also probably both use the same public bilingual corpora augmented by their own translation memory databases. Babelfish on the other hand relies on legacy rule-based machine translation technology. Our guess is the following. Google and Microsoft will come close, with Google edging its rival. They will both beat Babelfish by a mile! The reason we think Google will edge Microsoft is because of its fast growing bilingual and monolingual corpora. Also, when both Google’s and Microsoft’s translations are similar, we think more voters will chose Google. Another important point to keep in mind is that results will vary based on subject, style and language. So no matter what the published results are, it is best that you test for your specific use prior to adopting any engine. Most publishers of commercially sold statistical machine translation engines admit that you can only get valuable results from their products by customizing the engines with your own bilingual translation pairs, monolingual corpus, and bilingual glossaries. They therefore recommend a custom engine for each language pair and for each client! We also predict that when you use these tools, you will soon conclude that they are no substitute for human translators!